Nike Plus, commonly displayed as Nike+, is a software program that works by tracking the performance of runners through a wireless connection. The proprietary system, made by athletic equipment company Nike Inc., requires several components: the Nike+ sensor, a pair of shoes compatible with Nike+ and a Nike+ tracking device, including those made by Apple. The system also uses the Nike+ website to store each user’s personal information and running history and serve as a social media hub for runners. Those who want to use the tracking benefits of Nike+ must register with the website. The first step in using Nike+ is to purchase the components. The Nike+ sensor is used to track time, distance, pace, calories burned and other details as you run. The sensor is sold separately or as part of a package that includes one of several tracking devices. To activate the sensor, it must be placed under the insole of a Nike shoe that is compatible with Nike+. The company’s website lists more than 150 shoe styles that work with Nike+, as of September 2011, ranging in price from $51 to $195. The sensor then must be synchronized with a Nike+ tracking device. A variety of Apple products are compatible: iPhone 3 GS, iPhone 4, iPod touch 2G and iPod nano. Nike also makes sports watches that are compatible. The sensor is designed to provide real-time information while you run. Data on your pace, distance covered, time elapsed and calories burned is sent wirelessly to your Nike+ tracking device so you can access the information while you run. The Nike+ SportWatch and the Nike+ GPS app for the iPhone also use GPS tracking to map the route of your run. The Nike Plus website requires a computer with one of the following operating systems: Mac OS X v10.3.9 or later, Windows Vista or Windows XP -- Service Pack 2 -- Home or Professional. When you finish a run, the data can be uploaded to the website and used for a variety of functions. The website keeps a record of every run that is uploaded and allows runners to track their progress in terms of time, distance and other specifics. Among the benefits of using Nike+ is the ability to use features of the website to keep you motivated in your workout program. The website offers a variety of training programs through the Nike+Coach feature. 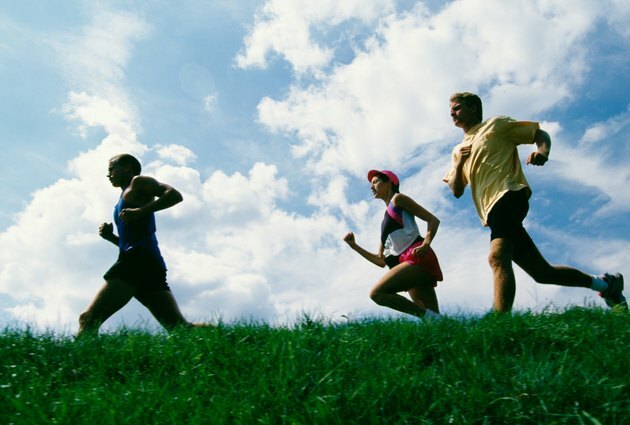 The programs are designed by running experts and offer a variety of choices based on running styles or training for specific events. The website also allows you to set goals for yourself and acknowledges achievements, such as personal best times and milestones based on the number of miles logged. The social aspects of the website can be used to issue challenges to other Nike+ members, play running-related games and share your running details on Facebook and Twitter. The website also has an option to create a running avatar and use it to perform a variety of virtual running functions.